Joy Mathew who is best known for his lead role in John Abraham's 1986 film Amma Ariyan and his directorial debut, Shutter is a man with multiple talents. 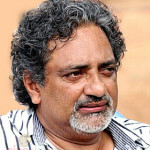 He is a director, film and theatre actor, playwright, and a political activist. It was in 2012 he made his directorial venture, Shutter which set within two days and a night in the city of Kozhikode portrayed the unexpected incidents that happened in a man’s life. The film premiered at the 17th International Film Festival of Kerala and at the 9th Dubai International Film Festival. It won the Silver Crow Pheasant Award for Best Feature Film (Audience Prize) at the 17th International Film Festival of Kerala. Joy Mathew is also a talented Playwright who was honoured by Kerala Sahitya Academy and Sangeetha Nataka Academy for two of his plays in 1995 and 1996. His most acclaimed plays are Athirthikal, Pretoria – 18 Oct, and Chile 73. Joy Mathew also bagged the Kerala Sahitya Akademi Award for the play Madhya Dharanazhi (1996).